Blog WSJT-X FT8 and the Icom 7300 the Easy Way! WSJT-X FT8 and the Icom 7300 the Easy Way! 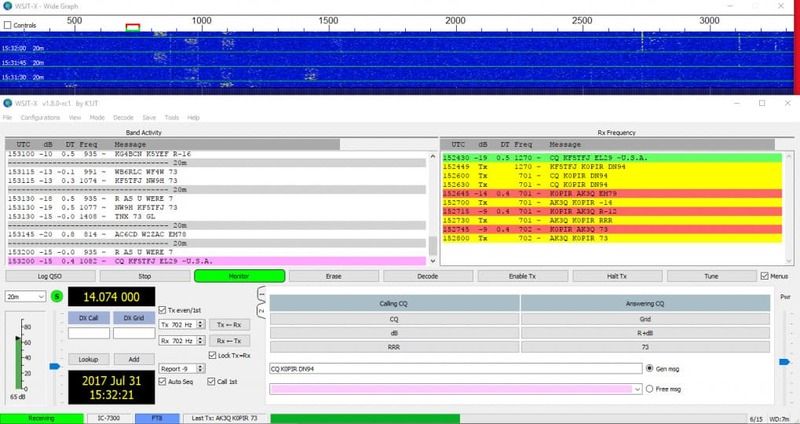 Are you looking for an easy way to try out the new WSJT-X FT8 mode? If you have the Icom 7300 I assure you this cannot get any easier or better. There’s no need for an external sound card (Signalink) or any other hardware. The Icom 7300 suffices. The only thing needed is a USB cable (install the driver from Icom before connecting a USB cable) and WSJT-X. Over the past few weeks I have run across Hams who have been using WSJT-X just like this. No integration with any other programs. There is really no need for JTAlert, QSO Relay or any logbook. 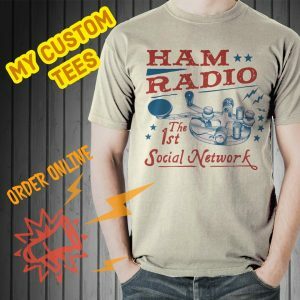 This is the preferred way to operate for many Hams. I’ll put the download link below. This is a safe, small and easy program to get running on your computer. Windows, Linux and Macintosh are supported. Go to the link below, click on it and download the file to your computer. From there it will vary, depending on computer OS, but in Windows just double-click the downloaded file and go through the installation prompts. It is super simple! Important: Use something for time sync. I use NetTime. In WSJT-X there are just a few configuration settings to get the Icom 7300 on the air with FT8. In the software, under File and Settings, on the General Tab enter your callsign and grid square. On the Radio tab select the Icom 7300 for the Rig. You’ll need to know your COM port number. On the Audio tab tell WSJT-X what your Soundcard Input and Output are. It’s going to be the Icom 7300 USB Audio CODEC for both. The rest is in the video. There are just a few more things to look at and you’ll be on the air. If you haven’t already done so, you can have a look at them here: Icom 7300 Easy Transmitter Settings For Digital Operation. Here are screen shots from my Icom 7300. 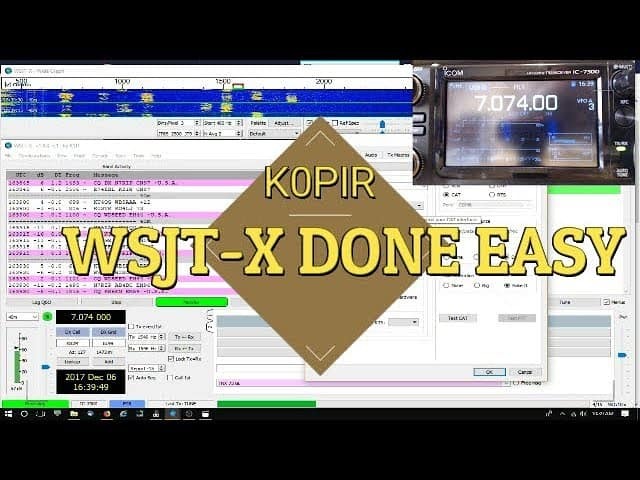 In this video I cover the download locations for WSJT-X, how to run it and using the built in logging capability. Also included, additional settings, making a contact and finally importing WSJT-X log into HRD logbook. Once you get it installed I have a few more videos on the Icom 7300 to improve reception, transmit and make the WSJT-X Wide Graph (waterfall) look its best. See below. Thank you for stopping by and visiting my website. There will be more to come on the IC-7300 and IC-7610. Have you been on FT8? What do you think about it? First, do you have a time sync program? Maybe your clock is off. I had WSJTx FT8 working with my IC7600, but the 7600 had to go out for replacement of finals..since then I have not been able to get decoding back on WSJTx. Got the sound levels set right, nice waterfall, lots of signals, but no decoding. I have dowloaded the Icom software – tried to reinstall driver, but I read some where the Windows USB audio codec drive reinstalls itself.. I do have a Win 10 computer, should I give up on the old Win 7 and just jump into the Win 10 setup? Do you have any idea how to run WSJT-X remote via RS-BA1 ? Thank you for commenting here. I have briefly tried it on the Icom 7610. It is much easier on that radio. I know Hams are doing it with the 7300, but I haven’t. One knowledgable Ham is Jeffrey Towle and you can find him though his Facebook group. I am sure they can help you. Is the Silicon Labs COM port showing up in Device Manager? You don’t see the USB Audio CODEC in Device Manager or in the Sound properties window? If not, I would try a different USB cable and a different physical port on the computer. Also, check to see you have the correct file downloaded from icom. It can be a little confusing on their page. I can not get the Icom 7300 USB Audio CODEC to show up. I have reinstalled the software from Icom seveal times but still do not get the codec to install. I am using windows 10. I installed without the usb cable connected and have restarted the computer after install. Hi there not got a 7300 got its little brother the 7100 I have the Cat connection, the TX can be operated from the pc, the meter on the bottom left. The Waterfall is showing signals. But nothing displayed on the Text screen. Hi there and thank you for commenting. Do you have a something to sync the computer clock to the Internet? I use NetTime. Possibly it is just not decoding because of that. I have the same setup as yourself. When i look at the audio-scope the received signal for ft8 looks flat topped , when the 7300 goes in to transmit my signal looks more of a sine-wave. I can receive ok plenty on the screen, i do not seem to make many contacts. my antenna is a ZS6BKW Multi-band Antenna at 40 ft looking out to the English channel . power is 50 watts on ft8 all settings on the radio seem to be as per the video. ft8 radio settings are USB in mode if i use data/pkt signal output seems lower Split operation is RIG . Nice to hear from you and thank you for posting your comment. Maybe change the “LEVEL” when using the Audio Scope on the radio and see if that is not it. Are you in USB-D mode when transmitting? I had to watch mine when using the rig for spilt (IC-7300) because it was a little quirky. I eventually settled on “Fake It” for split and yes, Data/Pkt should put the radio in USB-D mode. Thanks. Got WJST running quickly. The 7300 is so easy to use. I dumped a FTDX 5000 that required a separate device to run digital modes. The 5000 limited bandwidth in data modes to 2400hz which was irritating for FT8. Thank you. Happy to see you got it working. FYI the problems with my computer not working was my wifi dongle . I replaced the wifi dongle and everything is working great. Thanks to you I have been operating WSJT_X for several months. But suddenly this morning my USB audio codec drivers have disappeared! I am using a 7300 and HRD for rig control and logging. Where can I find the proper drivers to reinstall? Nice to hear from you and thank you for the nice comment. I really do appreciate it. It’s unusual they disappeared. I would try powering everything down, reseating the USB cable at the computer and the radio and then power everything back up. If you need to you can install the latest driver here. It’s from Icom. Yes I am in USB- D mode. I have made no changes to the radio from one computer to the next. I reinstalled the Silicon Labs driver and checked the codex driver both are to the latest revision. I know the radio works fine and I know the WSJT program works fine. My computer is a refurbished model. It seems to me it has to be the computer some how. Maybe I will get a new computer. That is unfortunate, but as you say everything works on your laptop it’s just when you move to the computer that it fails. I would try another USB port on the computer if you haven’t. I buy used computers and then eventually upgrade the hard drives to solid state. They are amazing and fast. Less expensive for me that way. I hope you get it resolved. Thank you for letting us know and best 73! I went to the device manager and it shows my sound card is working properly and it also has the latest driver. Are you in USB-D mode? The soundcard is really the Icom 7300. You are using the USB Audio CODEC for Soundcard input and output in WSJT-X? Are you decoding signals okay? I am using the silicon labs cp210 usb to uart bridge. I have a laptop and everything works perfect. I have a tower and both computers have win 10 installed. On the tower i receive signals I cannot contact anbody and i receive no responses to my CQ. Playback/record are set to CODEX. I am putting out a decent amount of power so I don’t think that is the problem. Everything seems to be set right and WSJT appears to be working fine just no response. I have made no changes to the radio settings. Nice to hear form you and that sounds like it could be a time issue. Do you have something to sync you computer time? I have ft8 working fine on one computer but not my other computer. There are no changes to the ICOM 7300 and I am using codex for both input/output on both computers. Do you have any ideas how this can happen? Is the same Icom driver loaded on both computers? What problem do you have with the one? RTS to low did it, thanks so much! Great instructions, finally allowed me to start working FT8. Only one issue, when I start Log4OM, it activates the transmit. If I revert to a saved load on the 7300, it works fine, switch back to my digital load on the 7300, and it keys down. What setting do I need to look at? Please check the RTS setting in OmniRig. RTS can be set to LOW. If that does not work for you. In the radio got to Menu>Set>Connectors and change USB SEND to OFF. I would try changing the software RTS first. That should work for you. Thanks for all your help–it is working perfectly now. You do a fantastic job. Hey Ben, glad you got it. It’s a fun rig and a fun mode. I hope to hear you on the air. Thanks, we are getting there. Will these audio setting affect RTTY or do I need to move them up? It won’t affect RTTY FSK, just AFSK if you’re using it. Even so it would be okay I would think. I followed your video to setup my 7300 for WSJT-X. I finally got it to work. I seem to be getting a lot of noise in my waterfall and some of the signals are way to wide, ie from 1000 to 1400. What setting do I need to change in the radio. Thanks for any help-your videos are great. It’s nice to hear from you and thank you for the question. If you see some unusually wide signals, check your frequency. Maybe you are not on the correct frequency for the mode you are operating on. For instance, FT8 on 20 Meters is 14.074. JT65 on 20 is 14.076. On a side note: I am using “Fake it” for split operation in WSJT-X. It is trouble free. Also use Data/Pkt for Mode in WSJT-X. That will set the radio to the correct mode which is USB-D automatically for you. No help, I have all the settings you suggested already. I GUESS I need to redo all the internal settings in the radio. It seems like too much audio is going to the computer. What does the green bar on the left hand side in WSJT-X look like? It should be green and maxing between 50 – 70dB. There’s only one thing in the radio to adjust for AF Output to your computer and software. that is the ACC/USB AF Output Level. Mine is at 30% now. In the computer for the Recording devices, select the USB Audio CODEC and you can adjust the level from there. Mine is at 15. Yours could vary somewhat, but should be around those. Getting the waterfall (Wide Graph) in WSJT-X setup can be tricky too. Those sliders are touchy. Thank you for very good, useful information. Nice to hear from you and thank you for the comment. Thanks for posting the screen shots of the IC-7300 data mode settings. I’d spent a few hours going back and forth between the IC-7300 and my laptop (running WSJT-X on Ubuntu Linux 16.04) trying to figure out why I could receive just fine but transmit was a no-go, I’d convinced myself It was a laptop setting, thanks to your screen shots it turned out that I’d missed a simple setting on the IC-7300. Very grateful, thanks! Good to hear form you and I’m glad it was of some help. Thanks for leaving the comment. I haven’t tried it with Ubuntu, but I’ll bet it works good. The Raspberry Pi is a blast. Thanks Rich…that did it! Hopefully this weekend I’ll get to play with it to see if I can actually get it rolling! Dan here…WA2BTR. I just got the Icom 7300 for Christmas so thank you for the excellent videos. You might have covered this, but when I plug the USB cable in I lose the computer audio. I am trying to follow along with your videos but can’t since the audio goes when I am connected! It’s probably a simple setting I am missing, but any help would be greatly appreciated! I do see the waterfall display on my computer screen by the way using N1MM Logger, but that’s as far as I have gotten. When I was using Windows 7 and my Signalink USB I had the same problem. Now I’m using Windows 10 and of course the 7300 or the 7610 and it works great. In the computer for the Playback devices I have the computer speakers set as the default. Then of course in the Ham software, I am using the USB Audio CODEC for soundcard in and out. See if setting your computer speakers as the default Playback device works. It’s nice to hear from you and thank you for commenting. Are you still seeing the waterfall and signals coming through? Verify you are on the correct freq. and mode. The radio is in USB-D mode too. It could be the time. Are you using something like Netime to sync your computer clock. When installing the driver, should I select bit version that matches the installed OS? It’s nice to hear from you and that’s a great question because even some of our programs are 32bit when we have a 64bit OS. Yes choose the one that fits your system. I have a 64bit. In the Windows File Explorer if I right click on This PC and select Properties, it shows the system information. Happy New Year and best 73! It’s nice to hear from you and thank you for the nice comment. I am happy this helped. Thanks Rich. You ended several days of frustration trying to get my IC-7300 to transmit using PSK 31 and HRD. One stinking little setting was wrong in the 7300. Thanks for your efforts with the very informative videos. I was just ready to start setting up for FT8 when your latest video came out. Perfect timing. Have a merry Christmas and a happy and healthy new year. Alright Roger. Thank you for commenting and letting me know. Best 73 and Merry Christmas! I so much enjoy the videos and learn a great deal when watching them. any change in correcting the fault for me. It faked me out for a while not transmitting and then I remembered your comment of the USB-DATA comment. Switching back manually sets it to one transmit then it goes and then back to usb. Happy New Year to you young man. Just listening to your voice mail 🙂 Long day here and -25f in Aberdeen, SD! I was using Rig for Split Operation and this can cause problems for some, as well as myself, so I am using “Fake it” for Split Operation. This works best. See if that does it for you Jon. File>Settings>Radio tab. Look underneath Split Operation and you’ll see “Fake it”. Use that. Nice to hear from you! See if that does it for you, let me know. HNY!